In collaboration with London’s Tate Britain and the Metropolitan Museum of New York, the Centre Pompidou in Paris will present the most comprehensive retrospective ever devoted to the work of David Hockney, from June 21 to Oct. 23. The retrospective closes at the Tate later this month on May 29 and will be at the Met from November 2017 to February 2018. The exhibition celebrates the artist’s 80th birthday, retracing his entire career through more than 160 works (paintings, photographs, engravings, video installations, drawings and printed works), including his most iconic paintings (swimming pools, double portraits and monumental landscapes) and some of his most recent creations. 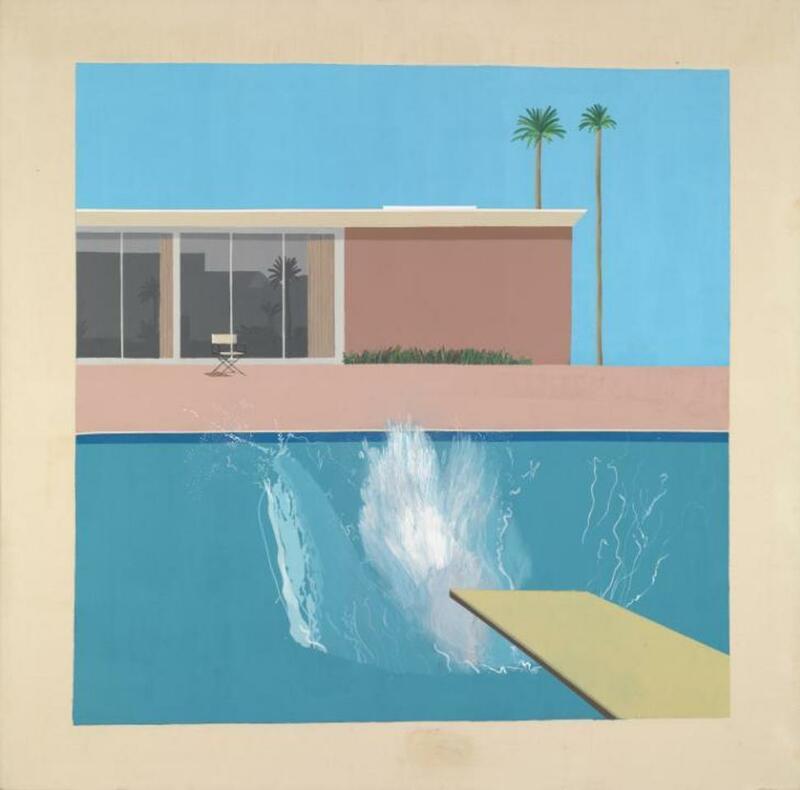 It focuses in particular on Hockney’s interest in modern technologies for the production and reproduction of visual images. Moved by a constant concern to ensure a wide circulation for his work, he has successively taken up the camera, the fax machine, the computer, the printer, and most recently the iPad. For him, artistic creation is an act of sharing. Edited by Didier Ottinger, curator of the exhibition, a 320-page catalogue with 300 illustrations will be published by the Centre Pompidou. This will include essays by Didier Ottinger, Chris Stephens, Marco Livingstone, Andrew Wilson, Ian Alteveer and Jean Frémon, and also an extensive chronology. The exhibition opens with paintings of Hockney’s youth, produced while at art college in his native Bradford, UK. Images of an industrial England, they testify to the influence of the gritty social realism of his teachers, members of the so-called Kitchen Sink School. At the Bradford School of Art and the Royal College of Art in London, Hockney discovered and assimilated the English take on Abstract Expressionism represented by Alan Davie. In Jean Dubuffet he found a style (informed by graffiti, naïve art...) that corresponded to his quest for an expressive and accessible art, and in Francis Bacon the boldness to explicitly thematise the subject of homosexuality. His discovery of Picasso, finally, convinced him that an artist should not limit himself to a single style: he called one of his early exhibitions “Demonstrations of Versatility”. In 1964, he discovered the West Coast of the United States, where he became the painter of a sunny and hedonistic California, his Bigger Splash (1967) acquiring an iconic status. It was there, too, that he embarked on the large double portraits that celebrate the realism and perspectival vision of the photography he also assiduously engaged in. In the United States, where he now lived, Hockney was confronted by the critical ascendancy of abstract formalism (Minimal Art, Colour Field Painting…). To the Minimalist grid, he responded by painting building facades and geometrically mowed lawns, and to “stain colour field painting” (which used dilute paint to stain the canvas itself) with a series of works on paper depicting the water of a swimming pool under different lights. In his costumes and stage designs for opera Hockney took his distance from a photographic realism whose possibilities he now felt he had exhausted. Abandoning the classical perspective associated with the camera (“the perspective of a paralysed Cyclops”, he once said), he experimented with different ways of constructing space. Looking again at Cubism, which sought to synthetically represent the vision of a viewer who moved in relation to the subject, Hockney used a Polaroid camera to produce what he called “joiners”, representations of the subject through multiple images joined together. Systematising this “polyfocal” vision, he created Pearblossom Highway from more than a hundred photos taken from different points of view. Searching for new principles for the pictorial representation of space, Hockney found inspiration in the Chinese scroll paintings that render the visual perceptions of a viewer in movement. Combined with the multiple viewpoints of Cubist space, this allowed him to produce Nichols Canyon, a representation of his car journey from the city of Los Angeles to his studio in the hills. In 1997, Hockney returned to Northern England and the countryside of his childhood. His landscapes reflect his complex reconsideration of the question of space in painting. Using high-definition cameras, he also brought movement to the Cubist space of his Polaroid “joiners”, juxtaposing video screens to compose a cycle of four seasons – a subject that since the Renaissance has evoked the inexorable passage of time. In the 1980s, Hockney began to explore the new, digital graphics tools available for the computer, producing new kinds of images. The computer was followed by the smartphone, and then the iPad, which he has used to create ever more sophisticated drawings, circulated among his friends by means of the Web.